Martin Winterkorn, former CEO of the German car manufacturer Volkswagen, arrives for questioning at an investigation committee of the German federal parliament in Berlin, Germany, in January 2017. "If you try to deceive the United States, then you will pay a heavy price," Attorney General Jeff Sessions said. "The indictment unsealed today alleges that Volkswagen's scheme to cheat its legal requirements went all the way to the top of the company. These are serious allegations, and we will prosecute this case to the fullest extent of the law." The government alleges that former company executives Richard Dorenkamp, Heinz-Jakob Neusser, Jens Hadler, Bernd Gottweis and Juergen Peter had knowledge of the cheating and that Winterkorn gave his consent to the scheme and subsequently misled regulators. Winterkorn, 70, was listed for the first time with the other five former executives originally charged in 2016. The scandal was revealed in 2015 when Volkswagen admitted to installing cheat devices in its diesel vehicles. This illegal software allowed the car to know when it was undergoing an emissions test, and turn on the pollution controls when vehicles were in a test and turn them off at other times. "What they programmed these vehicles to do is to sense when they're taking the test and actually operate differently at that time, and any time that they're being tested they would pollute less," says Jake Fisher, the director of auto testing at Consumer Reports. In June 2016, the Federal Trade Commission ordered Volkswagen to pay $20 billion in fines and invest in green technologies, such as electric schools buses and charging stations for electric vehicles, making the diesel emissions scandal the biggest consumer fraud case in the agency's history. Volkswagen "continues to cooperate with investigations by the Department of Justice into the conduct of individuals. It would not be appropriate to comment on individual cases," the automaker said in a statement to NPR. "I think it really took a, made a, shockwave through the entire industry," says Fisher of Consumer Reports. "This is the effects of what happens when you cheat. It really does not pay off." Meanwhile Gina Coplon-Newfield with The Sierra Club says that as long as Volkswagen's leaders are being held responsible: "I don't think it matters so much to us whether the company does well if they're doing well because they're selling cleaner vehicles and that's terrific." Volkswagen says it's continuing to cooperate with the U.S. Justice Department. The company's new chief Herbert Diess this week told shareholders in Berlin, "Volkswagen has to become more honest, more open, more truthful." 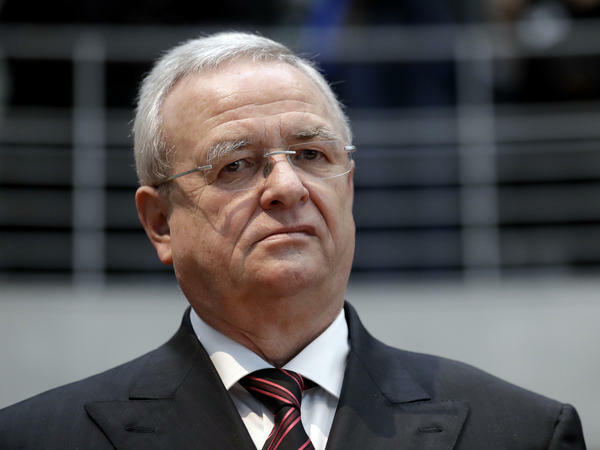 The former head of the German automaker Volkswagen has been indicted. A U.S. federal grand jury charged VW's former CEO Martin Winterkorn and five other top executives for conspiracy to defraud the United States and for violating the Clean Air Act. This comes as a result of the company's diesel cheating scandal you might remember. NPR's Sonari Glinton has the story. SONARI GLINTON, BYLINE: Volkswagen's so-called dieselgate began with cheating. The company installed software in its cars that - I'll just let Jake Fisher with Consumer Reports explain. JAKE FISHER: And what they programmed these vehicles to do is to sense when they're taking the test and actually operate differently at that time. And at the time that they're being tested, they would pollute less. GLINTON: Now, it was getting caught installing that cheating software that caused VW so many problems. Investigations sprung up on three continents. The company has had to pay more than $20 billion in fines, with a B, and now nine VW executives including the former CEO have been criminally charged. FISHER: I think it really took a - made a shockwave through the entire industry that this is the effect of what happens when you cheat. It really does not pay off. GLINTON: While the company has had to pay a lot of money in fines, it's unlikely that these former VW executives will see the inside of a U.S. jail cell. That's because the German government doesn't usually extradite its citizens. Gina Coplon-Newfield is with the Sierra Club. She says there's actually a silver lining to all this. That's because as a part of the settlement VW has had to invest in green technology for the public. GINA COPLON-NEWFIELD: VW is now being forced to spend billions of dollars to both compensate duped consumers but also to invest in such things as electric vehicle transit buses, school buses and port vehicles, as well as electric vehicle charging stations and public outreach. GLINTON: Volkswagen has clearly changed its direction since the scandal and is now investing in electric vehicles. Sales are up. The company has even surpassed its rival, Toyota. COPLON-NEWFIELD: You know what? If they've paid the price financially and if its people responsible have paid the price then, you know, I don't think it matters so much to us whether the company does well. If they're doing well because they're selling cleaner vehicles then that's terrific. GLINTON: Volkswagen says it's continuing to cooperate with the U.S. Justice Department, and this week the company's new CEO Herbert Diess told shareholders in Berlin, quote, "Volkswagen has to become more honest, more open, more truthful." Sonari Glinton, NPR News. Transcript provided by NPR, Copyright NPR.